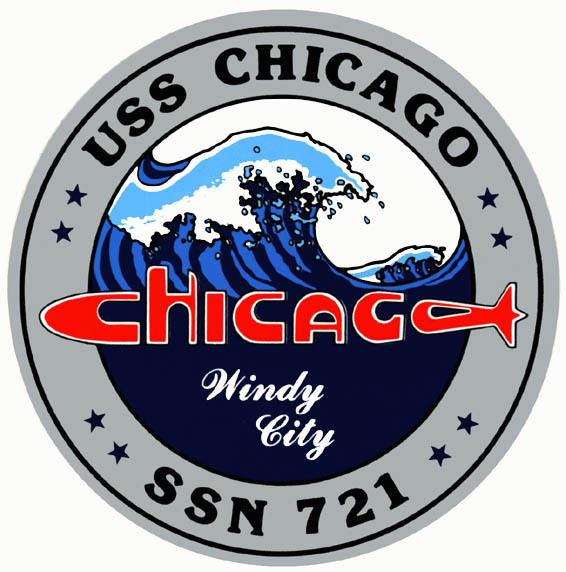 The attack submarine CHICAGO (SSN 721) is the fourth U.S. Navy ship to be named after "The Windy City." The first CHICAGO, a cruiser, was commissioned in 1889 and was classified as CA 14 in 1920. The ship was one of the Navy's first warships to be built of steel. She served in both the Atlantic and Pacific Fleets. Two notable naval figures, Alfred Thayer Mahan, author of The Influence of Sea Power, and Fleet Admiral Chester Nimitz served on CHICAGO as Commanding Officer. CHICAGO served as the Submarine Force flag ship prior to being decommissioned in 1923. The second CHICAGO (CA 29) also a cruiser, was commissioned in 1931. When the Japanese attacked Pearl Harbor on December 7, 1941 CHICAGO was at sea with Task Force 12. CHICAGO participated in the Battle of the Coral Sea in May 1942. (Supporting initial landings on Guadalcanal and the Solomon Islands.) On August 9, while the cruiser engaged the enemy in the Battle of Savo Island and was hit by a Japanese destroyer's torpedo. After repairs, CHICAGO participated in the Battle of Rennell Island where she was hit twice by torpedoes, causing severe flooding and loss of power. While under tow, CHICAGO was hit by four more torpedoes and sank on January 30, 1943. CA 29 earned three battle stars for her action in World War II. The third CHICAGO (CA 136) was commissioned as a cruiser in 1945. As a member of the Third Fleet, CHICAGO supported carrier air strikes and furnished shore bombardment in the final attacks against Japanese home islands until the cease fire in August 15, 1945. The ship participated in the demilitarization of Japanese bases and became the flagship of the Naval Support Forces, Japanese Empire Waters in 1946. CHICAGO was placed out of commission in 1947 after earning one battle star for her service during World War II. In 1958 CA 136 was reclassified as CG 11 and in 1964 was rechristened as the "Most Powerful Guided Missile Cruiser in the World". CG 11's primary mission was to operate independently or to provide defense for a task force against air, surface, and submerged threats. She saw extensive action during Vietnam and established a record by receiving 12 consecutive "E" awards for excellence in missilery. She also was awarded 11 Battle Stars, a Navy Unit Commendation and three Meritorious Unit Commendations for her Vietnam Service prior to being decommissioned in 1980. A committee has been established to have CG 11 donated to the city and serve as a museum. USS CHICAGO (SSN 721) is the Navy's 145th nuclear powered submarine and the 34th of the Los Angeles class. She was commissioned on September 27, 1986 at the Norfolk Naval Base in Norfolk, Virginia. USS CHICAGO can carry the full arsenal of submarine launched weapons, including torpedoes, Harpoon missiles, mines, and Tomahawk land attack missiles. 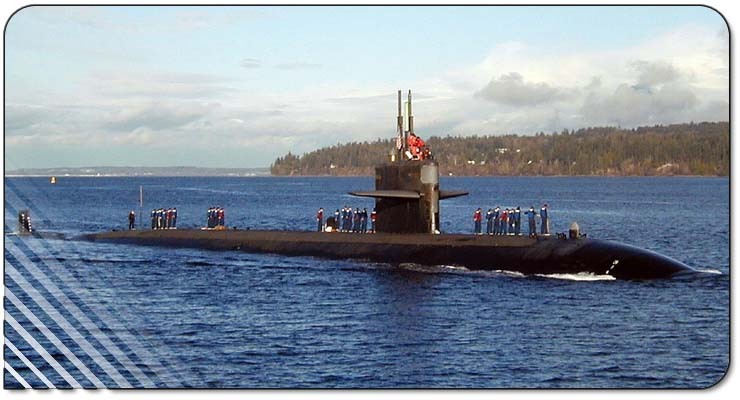 She is the first US submarine originally built with vertical missile tubes which gives her significant land attack capability. USS CHICAGO conducted an interfleet Panama Canal and arrived in San Diego, California in June 1988. Since arriving in the Pacific Fleet, she has conducted seven deployments, including operations in the Western Pacific, the Red Sea, and the Persian Gulf. The ship participated in Operation Desert Storm in the spring of 1991, conducting a 32-day Tomahawk missile patrol in the Red Sea. In 1992, she participated in the 50th anniversary commemoration of the Battle of the Coral Sea. In 1995, CHICAGO conducted operations in the Persian Gulf as a member of the USS INDEPENDENCE carrier battle group. Ports visited during deployed operations include Hong Kong, the Philippines, Singapore, Australia, Japan, Korea, Guam, and Bahrain. CHICAGO changed her homeport to Hawaii in June 1997. The ship has been awarded Meritorious Unit Commendation for outstanding performance during deployed operations. CHICAGO earned the Battle Efficiency “E” in 1990, 1991 and 1994, and has received two engineering Red “E” awards, the 1990 and 1991 CINCPACFLT Golden Anchor Awards, and the 1994 Arleigh Burke Fleet Trophy. Description of Coat of Arms:The positioning of the "Chicago" in submarine lettering is under the waves to emphasize that the boat is a submarine. The "Chicago" font lettering depicts obviously the shape of the submarine itself. The 4 stars surrounding "USS Chicago" on the top of the logo represent the 4 previous ships to bear the name USS Chicago. SSN 721 on the bottom of the logo is the boats hull number. The 4 stars surrounding "SSN 721" represent the 4 Admirals letters the ship has received during it's numerous deployments. Windy City is the nickname of the ships namesake city.